When the last issue of Harley Quinn ended, we saw a portal in S.T.A.R. Labs burst open and unleash a swarm of alien monsters inside the facility. With Harley still looking to complete the trials for the Lords of Order and Chaos, it seems fighting off a full-scale alien invasion is Harley’s next huddle to jump over. We begin right in the middle of the story, as Harley moves through the offices of the lab. She’s already bruised and beaten, with two blasters in her hands. Before Harley can make her escape and reach the exit, the swarm attacks. We flashback to Harley speaking with her mother about a cure for her cancer that may be inside S.T.A.R. Labs. Despite her mother’s pleas that Harley shouldn’t try to steal it from the lab, Harley goes there to do just that anyway. Not long after Harley gets in through a window, the building goes into full lockdown, blocking off all the doors and windows. We then cut back to the present, where Harley is doing everything she can to fight off the monsters. She keeps moving and eventually makes her way to a flight of stair where she runs into an unexpected visitor: the Joker. She follows him to an exit, trying to warn him along the way. He runs through a door and when she follows him, she runs directly into Batman. He tells her that he got her message and came to help her defeat the aliens. However, it soon dawns on Harley that she never sent Batman any message, and that as he kept talking, he started using a Brooklyn accent. At that moment, the aliens grab Batman and pull him into the shadows. As Harley calls out for him, her mother walks out of the darkness. She tells Harley that she needs her help before mutating right in front of her face. Harley then breaks down, dropping to the floor and stating that she can’t make it through this one. She is then greeted by Mirand’r, the Tamaranian working for the Lords of Order and Chaos. Harley then realizes that this is all just another trial for her before expressing her dissatisfaction with the entire process. Harley says that if the trials mean the possibility of dying, she wants no part of them. Mirand’r tells her that she had such high hopes for Harley but realizes now that it was a mistake to believe in her, and then she leaves Harley alone with the alien horde. 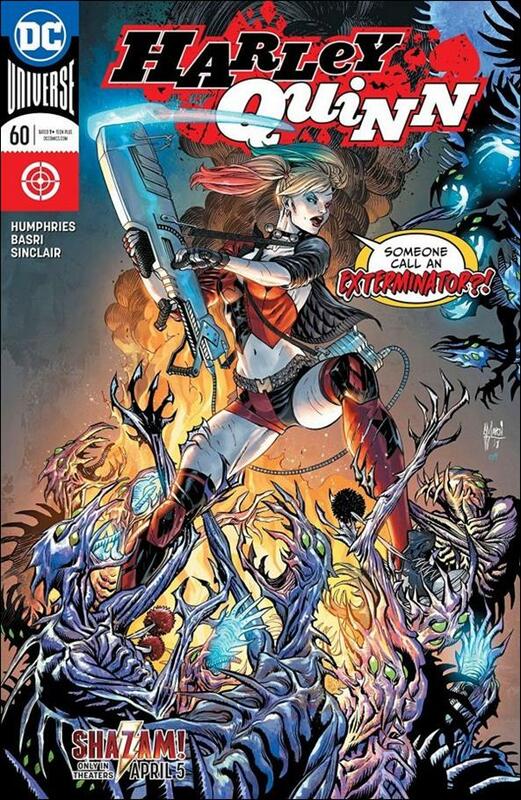 Harley fights them off as best as she can, leaving her standing on a pile of dead alien bodies as more and more rush to attack her. As she keeps fighting, she finds her way to the control room. There, she finds a giant floating space alien surrounded by alternate versions of Harley. The giant alien wraps one of its tentacles around Harley’s arm and shows her that it was taken from its home in space and away from its family. She realizes that the aliens she’s been fighting, Joker, Batman and her mutated mother are part of the giant alien’s self-defense system. Harley makes her way to the control panel, and with a little help from the alien, is able to send it back home. Outside, the cleanup crews have arrived, and S.T.A.R. Labs decides not to press charges for Harley’s break-in. She talks to her mother for a minute before another one of the gems on her belt lights up, signaling that she completed the trial. As she wonders what the next one will be, in Gotham, the Enchantress (last seen in Suicide Squad being dragged to Hell) breaks through the ground. She claims that while in Hell, her human half was burned away. She wants to make the world suffer, and she’s going to use Harley Quinn to do it. And another crazy, wacky Harley Quinn story is in the bag. As much as I’m used to the over the top, crazy stories for Harley, I’d still like the series to shift in a more grounded direction. I know that’s not going to happen, but it would be a nice change. However, I will say one thing that I have absolutely loved since this creative team has taken over is the art. I absolutely love Harley drawn in this fashion. While not my favorite when Harley is put in these ridiculous scenarios, the art style perfectly captures her and the world around her.